Obstructive Sleep Apnea occurs when the airway completely collapses blocking airflow into the lungs. The harder one tries to breathe, the tighter the airway seals. This airway obstruction persists until the brain partially awakens the person. Unconsciously, he/she will close the jaw returning the tongue and throat to a normal position. The Sleep Apnea cycle - falling asleep, jaw relaxing, airway collapsing, unconsciously awakening with a gasp, falling back asleep - can repeat itself 50 or more times per hour during the night. With a blocked air passage, one does not receive enough oxygen. Both the awakenings and oxygen deprivation can then trigger other health problems. The TAP (Thornton Adjustable Positioner) is based on the same principle as that of cardiopulmonary resuscitation (CPR). The airway must be opened to allow air to pass through the throat. A constricted or collapsed airway causes snoring or Sleep Apnea. The TAP holds the lower jaw in a forward position so that it does not fall open during the night and cause the airway to collapse. 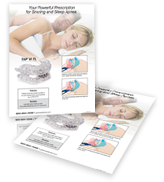 The TAP maintains a clear airway to reduce snoring and improve breathing. 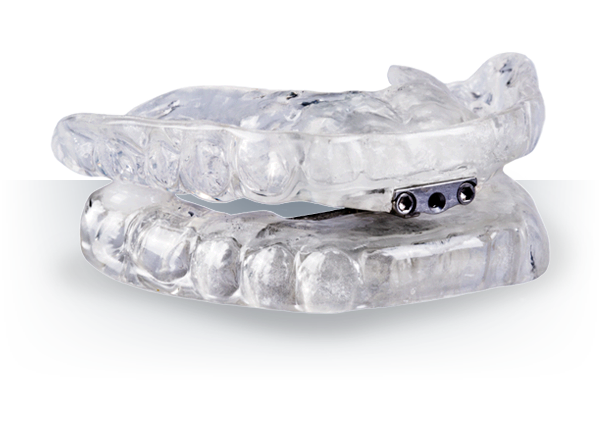 Ask your dentist for more information or request a list of dentists in your area that prescribe oral appliances for snore prevention or sleep apnea. 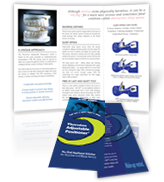 Take this TAP 3 Elite Flyer to your dentist who can prescribe you a TAP 3 Elite.